OLD PARKED CARS. 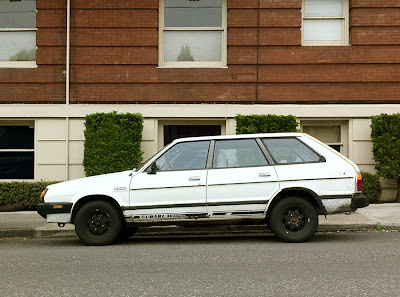 : 1980 Subaru DL Wagon. 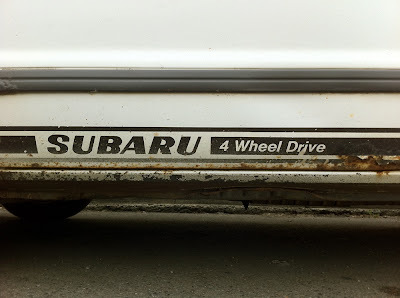 Enough with these horrible Subarus! Oh man, good luck finding a replacement for that decal. This bodystyle of GL looks way better than the '84-'94 version. i don't know about ben, but that's the last subaru i've got in my inventory. it is rather horrible, mikael, but is at least partly redeemed by the side graphics and the round headlights, which are very rare, plus the charming rusty headlight cages. there's a certain wackiness to late 70s/early 80s Japanese cars I just can't get enough of. 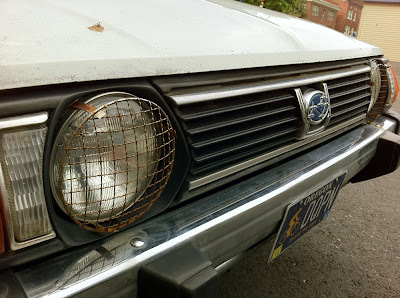 Really digging the the front end; round headlights, bumperettes, and that old Subaru emblem with the line connecting the stars. No way am I committing to any cap on 80s wackiness! Every strange feature must be documented before they're all gone, and hopefully they changed graphics mid year so we can get a really good perspective and all the different color combinations too. Heck, look at that surface rust. I know that's pretty light for a 1980 in the USA, but those graphics might be unrecognizable in a year. And how many of them could still be out there? I'll admit, at first glance I said to myself "Oh no, he put one of thatgeneration on top? But those details need to be remembered. Absolutely. Absolutely indeed. 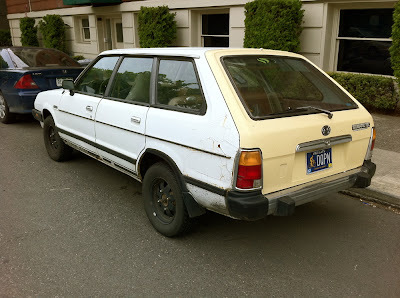 I've got an admitted soft spot for that generation of Subaru wagons, though, especially with the single round headlights. I want to say that's actually a DL because of the lights, a GL would have single square lights in '80-'81. Hatch is a transplant and brought the GL badge with it. 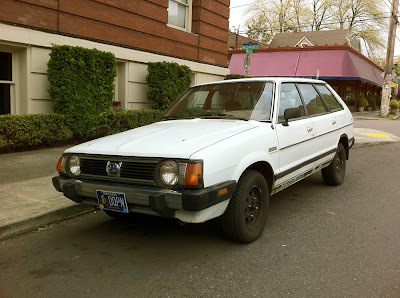 Don't think I've ever seen a wagon with round headlights. The color of that wagon door almost ruins this for me, any color but off white! Primer white would be just fine.